Quality Zipper stocks all of the zipper parts you need. 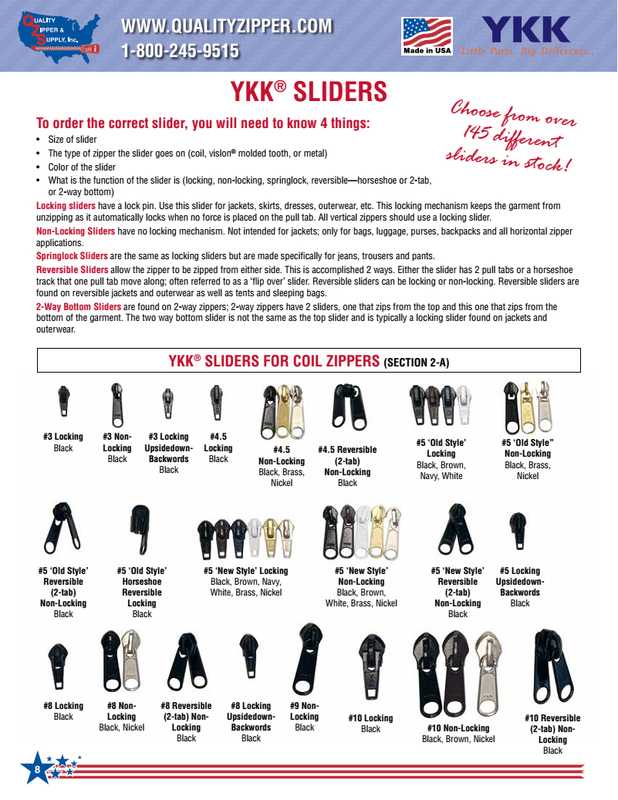 We have over 145 unique YKK® zipper sliders. We also stock zipper stops (top and bottom) as well as zipper by the yard, commonly referred to as zipper chain or continuous zipper. "YKK" and the combined mark of "YKK Little Parts. Big Difference.” are registered trademarks of YKK Corporation in the USA and other countries/regions. This Price List is a form that you can print out to view all of our in-stock items. All of the items on this list are in stock and ready to ship as soon as you place your order. This is not an online order form but rather a list of all our stock items. You cannot order online from this price list. Because this Price List is well organized and easy to follow, many customers use this form to inventory their stock and place orders. You can fill out this Price List and fax or email your orders using this form. Many customers use this Price List as a guide to place orders online as the Online Order Form looks the same. This price list contains almost all of our in-stock items but if you want to see a complete listing of everything we stock, with up to date specials and closeouts, you can only find that at the Online Order Form. 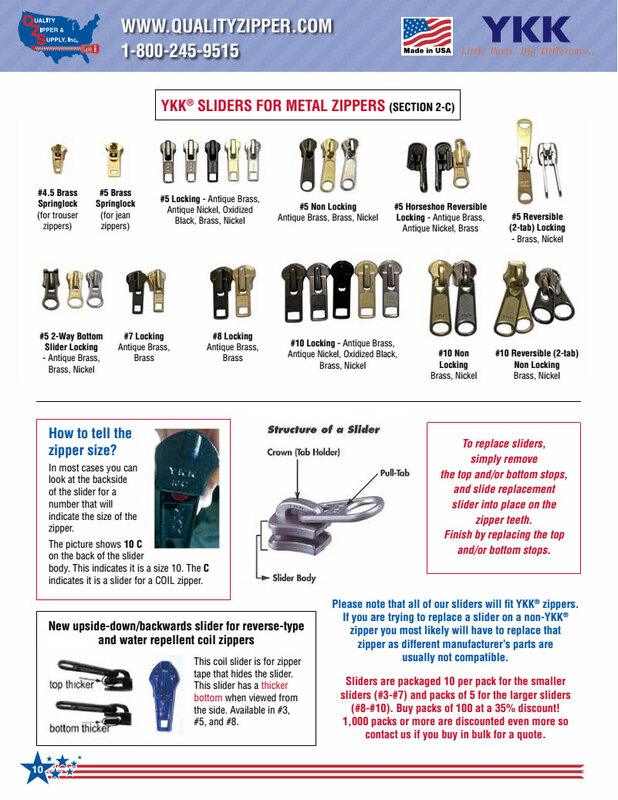 The YKK products listed on the Price List and in the Online Order Form are the most popular items ordered. If you do not see the items, colors, or sizes you need to purchase and you do buy in bulk quantities, please go to the SPECIAL ORDER menu button as we can special order any YKK item for you in any length and color. BULK ORDERS:If you are looking to purchase a very large quantity of an item, we can offer you bulk pricing. Please email Scott at qualityzip@aol.com with the quantity and information on the item you wish to purchase in bulk. BLANKET PURCHASE ORDERS:If you are interested in assuring a constant supply chain at minimal cost, we do offer blanket purchase orders. Blanket purchase orders are generally extended for 6 months to 1 year or longer. You commit to a guaranteed purchase amount of your desired items over that time and we will assure that it is delivered on the dates you specify and you are only charged at the time of shipment. For more information, please email Scott at qualityzip@aol.com. This Online Catalog allows you to view our Catalog online without waiting for a copy to arrive in the mail. You cannot order online from this catalog. Please click the ORDER ONLINE button below if you wish to place an order. This is the latest version of our catalog. Please understand that the products listed in the catalog may be a little outdated. If you want up to date information on the products we stock and pictures of each item please go to the Online Order Form. Prices are not listed within the Online Catalog. Pricing can be found on the Online Order Form as well as our Price List. 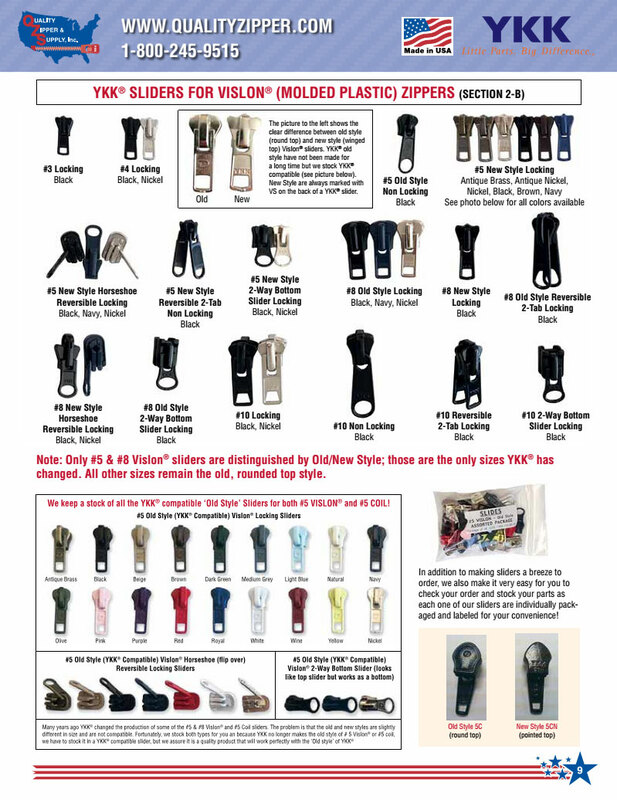 The YKK products listed in the Online Catalog, the Price List, and the Online Order Form are the most popular items ordered.If you do not see the items, colors, or sizes you need to purchase and you do buy in bulk quantities, please go to the SPECIAL ORDER menu button as we can special order any YKK item for you in any length and color. All orders are shipped the same day you order! All orders are shipped neat and organized for easy check in! 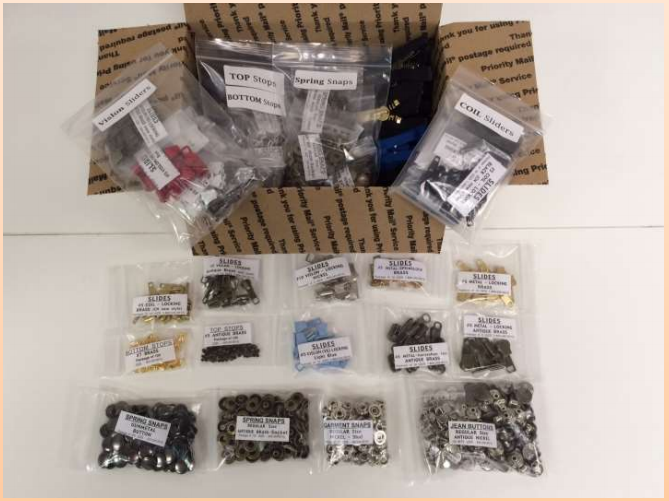 All parts are individually packaged and labeled for your convenience! Very few backorders and if there is one, we pay for shipping the backorder!